A video report prepared for eyeJAZZ.tv by Lindalee Lawrence. 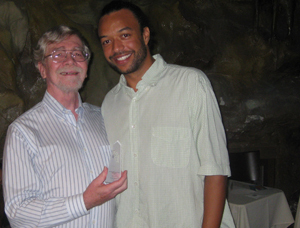 Thanks to all who attended or watched the live webcast of June 11, 2011 JJA Jazz Awards presentation at City Winery. 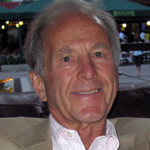 JJA President Howard Mandel gives a full report of the day's events at JJA News. The winners of this year's awards in 39 categories of jazz music-making and journalism are listed after the jump. Click black rectangle at lower right of viewer to view webcast FULL SCREEN. You can even watch the webcast on your smart phone with a Ustream app. Please consider making a donation to support the Awards and the year-round educational and new media work of the JJA--all aimed at building new audiences for jazz. Arcata CA | Berkeley CA | Boston | Chicago | Nashville | Portland OR | Seattle | Tallahassee FL | Washington D.C.
Jazz happens everywhere-- and the JJA Jazz Awards will be celebrated everywhere on Saturday afternoon June 11. In a number of places, jazz fans will gather at informal "satellite parties" to watch the live webcast of the awards presentations and performances as they happen at City Winery in New York City. These parties are a way for local jazz supporters to affirm that jazz is alive and well in their communities and to share notes and plans for the coming year. There may be a satellite party near you: Each party is different and is being organized by local hosts. Most are open to the public with no cover, cash bar and free light snacks; some will also offer free Brother Thelonious Ale, courtesy of JJA Jazz Awards sponsor North Coast Brewing Company. All promise big screens on which to watch the Awards. Check back soon if there's no party listed in your area; more are still in the planning stage. Confirmed parties are listed below, check with the organizers for more details and RSVP information. The winery will have a no-host bar (including mango mimosas) and brunch hors d'oeuvres available for purchase. 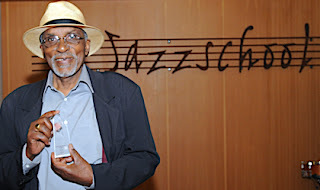 At this second annual Jazzschool satellite party, local vocalist Ed Reed will be honored as a JJA "Jazz Hero." Call the school for more information. 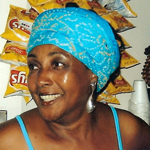 Elynor Walcott and her sons Paul, Frank, and Lloyd Poindexter, who own and run Wally's, will be honored as JJA "Jazz Heroes" for their decades-long dedication to providing a forum for young players to develop their craft. WGBH jazz radio hosts and former JJA honorees Eric Jackson and Steve Schwartz will present the awards to the family. The Chicago party will be webcast on Ustream, too. 'Like' the Chicago party Facebook page. Bassist Roger Spencer and pianist Lori Mechem, husband/wife partners who operate the Nashville Jazz Workshop, a music community education center, will be honored as JJA "Jazz Heroes." Cash bar, buy-your-own-menu. Bring jazz fan friends; enjoy lunch and the Jazz Awards webcast. John Gilbreath, director of Earshot Jazz and radio broadcaster extraordinaire, will be honored as a JJA "Jazz Hero" at this second annual JJA Jazz Awards satellite party organized by Earshot Jazz. We're pleased to say it's the first JJA Jazz Awards party in Florida-- Gerri says there'll be "cash bar, snacks and our B Sharp's Gumbo for as long as they last. All B Sharp's customers and any other area jazz lovers are invited!" Omrao Brown, managing co-owner and curator of the Caverns, will be honored with a JJA "Jazz Hero" award presented by JJA member WPFW-FM radio jazz host Rusty Hassan. Rusty Hassan giving Omrao Brown his Jazz Hero award. JJA 'Jazz Heroes' are activists, advocates, altruists, aiders and abettors of jazz who have had significant impact in their local communities. 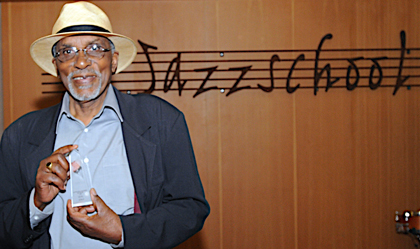 The 2011 'Jazz Hero' awards were presented on June 11, 2011 in conjunction with the presentation of the Jazz Journalists Association's Jazz Awards honoring significant achievements in jazz music and journalism. Omrao Brown, co-owner and manager of Bohemian Caverns in Washington, D.C., has garnered a local and national reputation as best jazz venue in the capital for a club celebrating its 85th anniversary in 2011. Omrao grew up in Connecticut and Massachusetts, immersed in jazz from birth as son of Dr. Leonard Brown, an accomplished saxophonist and musical scholar at Northeastern University. Surrounded by the music and its practitioners, he dabbled in violin and saxophone, but after graduating from Northeastern embarked on a career as a computer engineer, his work for nearly a decade. In 2006, however, Brown decided to reinvest in his love of music —"I figured it's best to do it when you're young," he says — and joined a partnership to purchase Bohemian Caverns. Five years later, under Brown's stewardship, the Caverns balances weekly spoken-word and open-mic nights with a full schedule of jazz legends, up 'n' coming national acts and a steady rush of homegrown District talent. His support of local musicians has brought a particular charge to the D.C. scene. With the establishment of the Bohemian Caverns Jazz Orchestra as the house big band, an artist-in-residency project and a weekly late-hours jam session led by a rotating cast of players, he has created a de facto headquarters for area musicians which gratifies loyal audiences every night. 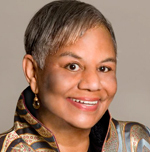 Peggy Cooper Cafritz has been a significant jazz – and education -- hero in Washington D.C. at least since 1971, when she co-founded the Duke Ellington School of the Arts with Mike Malone. She served the school and its non-profit affiliate the Ellington Fund from then until January 2001, when she became the first publicly elected president of the District of Columbia Board of Education (and served two consecutive terms). This is but the top layer of Ms. Cafritz's arts community activism and doesn't touch on her journalistic background: She was an Award-winning programming executive and documentary producer for Post-Newsweek Stations and WTOP-TV (now WUSA) during the mid 1970s, and after leaving those positions executive director of the Minority Cultural Project, with Harry Belafonte and WQED/Pittsburgh working to develop a dramatic literary series for the Public Broadcasting Corporation. Starting in 1986, she had a 14 year tenure as WETA's "Around Town" arts critic – for which she received an Emmy Award. Besides many educational positions, she chaired the D.C. Commission on the Arts and Humanities, and in 1993 was appointed by President William Jefferson Clinton to serve a vice-chair of the President's Committee on the Arts and Humanities. From 1989 to '90, she co-chaired the Smithsonian Institution's Cultural Equity Committee, initiating greater racial and cultural diversity to the Smithsonian's personnel and programs. She has been a longtime art collector, has sat on the boards of many significant arts and cultural institutions, always working to have minority artists receive equitable consideration in exhibitions and financing. Youth is also an important focus on her work and life – she now concentrates on refining her collection to emphasize younger artists, and she gives college scholarships to three Duke Ellington School of the Arts students every year, in honor of her own children. John Gilbreath is the executive director of Earshot Jazz, Seattle's non-profit jazz-support organization, and by thinking globally, acting locally, he has demonstrated the attributes of a genuine jazz hero. Gilbreath is responsible for Earshot Jazz, a monthly publication; various educational programs and services to the community, and the presentation of more than 100 concerts annually, including the highly regarded Earshot Jazz Festival, now in its 23rd year as a major annual Seattle event. Gilbreath serves as artistic director of regional jazz initiatives such as the Bellevue Jazz Festival and the Art of Jazz series at Seattle Art Museum, and has programmed the Anacortes Jazz Festival, Experience Music Project's Jazz in January series, and myriad other events. He's also a busy radio programmer, six days a week hosting a mix of jazz and international music on KBCS-FM's morning weekday show "The Caravan," bringing new and adventurous jazz to "Jazz Theater," Sunday nights on KEXP-FM. Don Z. Miller is Arizona's jazz impresario, an active producer, advocate and supporter of live music for four decades. Founder and president of Concerts and Music Productions Inc., Miller has booked top-name musicians for 34 years of the annual Paradise Valley Jazz Party -- world-renowned stars of the swing, bebop, hard bop and modern eras. 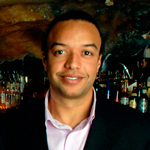 He's also one of nine founders of Jazz in Arizona Inc., a 34-year-old nonprofit jazz-support organization. From 1989 through 1992 he produced the Phoenix and Scottsdale Jazz Festivals, featuring a stylistic range from the Lionel Hampton Big Band to Spyro Gyra, Rebirth Jazz Band, Dave Brubeck Quartet and the Clark Terry-James Moody Quintet, among others. For Jazz in AZ, he conceived and produced "Treasures of Jazz" concert series, with artists such as Ellis Marsalis, Danny Barker, Bud Freeman, Dave Frishberg and Art Van Damme. He's also organized and led tours to jazz festivals in Europe and produced several Festivals de Jazz in Puerto Peñasco, Sonora, Mexico. Don was proclaimed "Arizona's First Citizen of Jazz" by Gov. Bruce Babbitt of Arizona, and named "Promotor Turistico" by the State of Sonora Tourism Department in Sonora, Mexico. He is author of two non-fiction books and publisher of music-instruction books. Dr. Maitreya Padukone moved to the United States in 1977 and opened his dental practice on the Upper West side of Manhattan in 1981. From that base, he has treated pro bono numerous musicians referred to him by the Jazz Foundation of America, become president of the New York County Dental Society, and has also been able to pursue his passion for music, continuing studies and performing on tabla, traditional tunable Indian drums. He is both a world music maven and a jazz hero. "I believe that everybody is born to be blue," says Ed Reed, the 82-year-old, Richmond, California-based jazz singer, who made his recording debut just four years ago. "We need to acknowledge that." After 40 years of heroin addiction and incarcerations in San Quentin and Folsom prisons, the singer – now clean and sober for 25 years -- proves with music and extra-musical activities, too, that such recognition is a step towards better days. "The good stuff takes care of itself," Reed continues. "It's the sad stuff that you really need to pay attention to, 'cause it'll really drag you through the mud if you don't acknowledge it and let it go. So many of us hold onto our sadness, but we need to shout about it, sing about it." Reed (no relation to JJA Jazz Hero Mike Reed) emphasizes such insights as a substance abuse educator at Kaiser-Permanente's Chemical Dependency Recovery Program in Vallejo, California, and at other health agencies. "This work," he says, "is as important to me as music." He fell in love with jazz on Los Angeles radio around 1940. Introduced to heroin while in the army, Reed tried to launch a singing career upon discharge but was undermined by his addiction. He kept singing while jailed, but didn't emerge publicly until the early '90s, gigging at Bay Area restaurants. In 2005, Reed impressed JazzCamp West instructor Peck Allmond, who co-produced his initial release, Ed Reed Sings Love Stories. His follow-ups are The Song Is You and Born to be Blue. 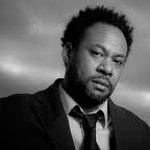 Drummer/composer/promoter Mike Reed has played a significant role in Chicago's music scene for the past 15 years. More concerned with driving a band than producing virtuosic fireworks, and with becoming a presenter to innovatively support local efforts, Reed's projects have come to gratifying fruition. At age 36, Reed leads People, Places & Things, a quartet paying tribute to Chicago jazz of the mid-to-late 1950s, and the quintet Loose Assembly, in which he explores spontaneously and collectively shaped and structured music. Besides his musical achievements, in 2001 he started co-curating with cornet player Josh Berman the Sunday Transmission Series at the Hungry Brain. Since then, he has been involved with the indie rock Pitchfork Music Festival -- now a major summer event for the Windy City – and the Umbrella Music Festival, which promotes exchanges with fellow improvisers from Europe and elsewhere. 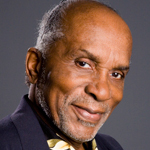 He has also served on the programming committee of the Chicago Jazz Festival. Roger Spencer and Lori Mechem would have given more to Nashville's jazz scene than most had they merely served as dedicated educators and players since their arrival in Music City in 1988. But they've gone much further, becoming true jazz heroes. Their crowning accomplishment, the non-profit Nashville Jazz Workshop, turned ten years old last fall, and the city wouldn't be the same without it. A school for mid-career pros and advanced amateurs and a live venue with a unique vibe, it has become the gathering place for a community of jazz players and fans. Roger and Lori's genial but demanding journeyman/apprentice teaching style, establishment of visual arts exhibits and performance series and support of other local jazz educational and performance events has built the NJW into an irreplaceable institution in a town where, due to an abundance of talent and activity across many genres, jazz has to fight hard to be heard. Roger attended Indiana University to study jazz under David Baker (a JJA "A Team" member), and graduated from Indiana State with a Bachelor of Music Education degree. Bassist for Les Brown and His Band of Renown, Harry James, Rosemary Clooney, Tony Bennett, Eddie "Lockjaw" Davis, Terry Gibbs and Buddy DeFranco, among others, he's also performed and recorded with Lori, is a longtime member of the Beegie Adair Trio and is on Vanderbilt's Blair School of Music faculty. At the NJW, Roger is responsible for administration and financial management, and teaches improvisation, theory and ensembles. Elynor Walcott and her sons don't seem to consider themselves "jazz heroes," only people who've had a great time carrying on a family tradition. But to the thousands of music fans and musicians who have been to Wally's Cafe Jazz Club, the funky and storied, no-cover Boston music room run by Elynor and her progeny, 'heroes" sounds exactly right. Wally's has been a family operation from the time Elynor's father Joseph "Wally" Walcott, an immigrant from Barbados, opened it as Wally's Paradise in 1947. Today Elynor is fulltime CEO, sharing responsibility with sons Paul, Frank and Lloyd Poindexter for a business that has become an official cultural treasure. The Bostonian Society has marked Wally's as a historic site, on a list with Faneuil Hall and Old South Meeting House. In 2009 Elynor told the Boston Herald, "My father and mother told me they brought me there in a basket when I was a baby." Jazz royalty, including young Roxbury native Roy Haynes, graced the place from early on, and Wally had the idea of hiring music students from Berklee, New England Conservatory and the Boston Conservatory to perform, a practice that continues. So well before moving across Massachusetts Avenue in 1979 to its current location, Wally's ushered new generations into jazz. "My father was a pioneer, but as a little girl I didn't know that," said Walcott. "I did know that he was a very hard worker. He was always at Wally's, working so hard. Our mission - myself and my three sons - is to be legacy-keepers for my father. He created Wally's, along with my mom." The JJA Jazz Awards gala is coming up fast: Saturday June 11, 1-5pm EDT at City Winery in New York City. This star-studded event, m.c'd by Josh Jackson of The Checkout from WBGO, will feature presentation of 39 awards for high achievement in jazz music and journalism as well as performances by Randy Weston, Wallace Roney, Gregory Porter, Jane Bunnett and Hilario Duran and the Hammer Klavier Trio. Tickets are going fast, so buy them now . Not going to be in NYC? You don't need to miss any of it . . .
Just confirmed! Jazz fans and supporters will gather in Chicago, Nashville and Arcata, California to watch and celebrate the June 11 JJA Jazz Awards. These satellite parties are in addition to the previously announced parties in Berkeley CA, Boston, Portland OR, Seattle, Tallahassee FL and Washington D.C. 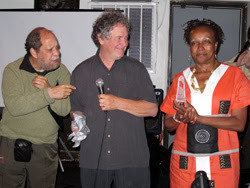 The Jazz Journalists Association has named its 2011 "Jazz Heroes"-- activists, advocates, altruists, aiders and abettors of jazz who have had significant impact in their local communities. These awards will be presented on June 11 in conjunction with the presentation of the 2011 JJA Jazz Awards honoring significant achievements in jazz music and journalism. 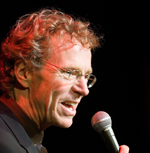 Josh Jackson, host of The Checkout on WBGO Jazz FM, will be the Master of Ceremonies as the Jazz Journalists Association presents its 2011 JJA Jazz Awards at a gala scheduled for June 11 1-5pm EDT at City Winery in New York City. The awards presentation will be live videostreamed and viewed simultaneously at satellite parties at various locations in the U.S. and elsewhere.